If you need to cook the kale, heat the fat/oil in a skillet over medium-low heat. Sauté the garlic for 1-2 min until golden. Add the kale, one handful at a time, and sauté until all the kale is coated with fat/oil. Cover and steam until tender, about 10 min. Preheat the oven to 350. I used the toaster oven for this. If you have leftover kale, place it in a small casserole dish. 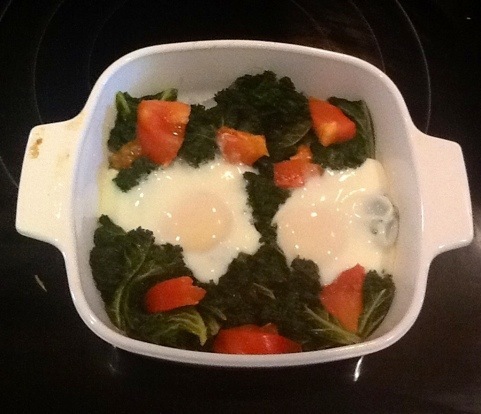 If you are cooking the kale in the morning, you can leave the kale in the skillet for the following steps and cook everything on the stovetop in the skillet with the lid on (in which case, sorry, turn the oven off). Add the diced tomato. 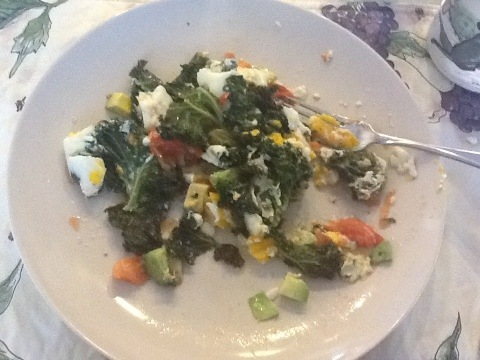 Make 2 wells in the kale and crack the eggs into the wells. Cover and bake (cook) for 10 min. Transfer to a plate and top with diced avocado, add salt and pepper to taste. This would also taste fantastic with crumbled bacon on top. If I weren’t doing Whole30 I would have also added shredded cheese. At first I thought this tasted just okay, probably because there was no bacon in it. 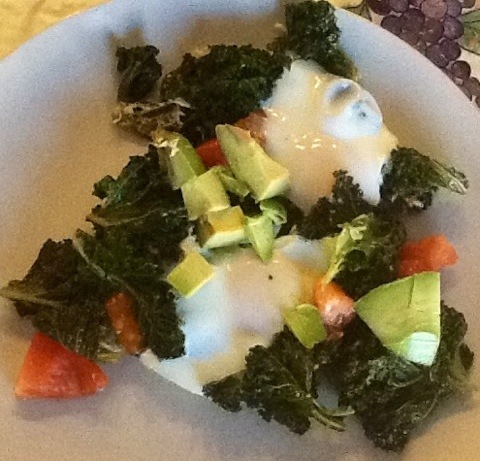 Then I realized that if I mashed up the eggs and avocado and mixed that all up so it coated the kale, that it was very delicious! I know it doesn’t look as appetizing like this, but just trust me on this one! While this was baking Tom came in and asked what I was making, and I learned that he and Dora hadn’t eaten yet. So much for that Mommy of the Year award. Tom called up to Dora and asked if she wanted him to fix her a scrambled egg. Dora replied, “you know how to make that?” Tom gets no credit. Dora is usually the one who fixes scrambled eggs on Sunday morning if I’m not feeling well, while Tom fries the bacon. Tom actually fixed a fantastic dinner last night, but I haven’t been able to convince him to write a guest blog. Maybe some reader requests would help? Dora’s comment reminded me of walking into the kitchen when I was about her age and Dad (Grandpa) was making homemade beef vegetable soup. He said, “I bet you thought I couldn’t cook”. I’m sure my face warranted that comment. Mom (Grandma) was in the hospital for a couple of days and he took over and made all of our meals. 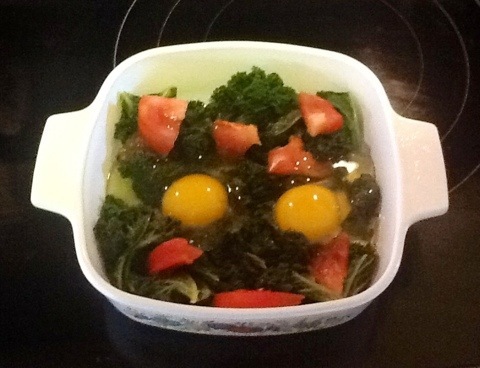 I’d love to try the kale and eggs; haven’t tried cooking kale and I see you use it a lot. Maybe while I’m back we can fit it in. What a neat story, Mom! That is impressive that Grandpa made homemade soup! I’m sure you’d like kale. Aesthetically I love how it stays a really brilliant green. I’ve been trying to rotate all the different greens through our diet. Tom has always liked greens, and now Jewel eats them as well. This looks great! I love that it’s quick & easy 🙂 I just found your blog through Chowstalker. Today is day 1 of my first Whole30. I’d like to pin this recipe to make sometime very soon! I hope you’re feeling better! Thanks, Heather! I’m feeling much better this week. I hope you enjoy the recipe! Good luck on your Whole30 – I’ve got one more week! Most of my recent posts are Whole30 legal if you need some ideas.